Lessons learned in Pregnant Butch: there are not nearly enough public toilets in New York City, suspenders are not a practical sartorial choice during pregnancy, and castor oil is just disgusting (and may not even induce labor). Author A.K. 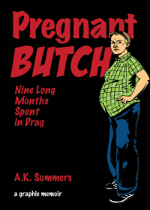 Summers chronicles the journey of her pregnancy as (you guessed it) a butch woman in this autobiographical comic. The subtitle, “Nine Long Months Spent in Drag,” points to the core complication in Summers’ book: how does butchness interact and cope with the traditionally super-feminized experience of pregnancy? The reader follows the author (“Teek”) and her girlfriend Vee from before conception to the birth of their child, creating a natural arc from which to hang the more philosophical meanderings. Along the way we meet the gay obstetrician, the wise crones, the friend/sperm donor, the landlord fixated on calling Teek “mommy,” and the various midwives, pregnancy coaches, and friends that contribute to Teek’s experience. The art style draws inspiration and allusions from Hergé – some moments are more Tintin than others – and is consistently self-referential, tongue-in-cheek, and willing to mix metaphors to get the point across. Originally printed as a serial on Activate Comix, the overall narrative is broken apart into smaller, individually titled stories that together compose the whole. The personal meditations are interspersed within the narrative, bringing up her feelings about wanting a biological child after growing up as an adopted child, and about failing to excel in the performance of pregnancy and its interaction with her butch identity. “Does it matter if pregnancy is a wrong state for me?” she asks. “So what if I don’t find it deeply satisfying to get in touch with my essential womanhood? Isn’t it all right to permit some disjuncture to intrude on one’s sense of self?” By the end of the book, it seems this disjuncture was worth it. 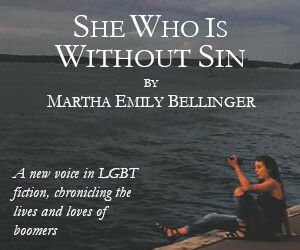 She also touches on the claiming of a butch identity that has slowly become dated in a new landscape. In one digression, she claims that it is “the age of the transman,” and that butches are being phased out; I found this section a bit puzzling, as in its depiction of Teek’s feelings of being left behind by a newer generation, it seemed to conflate a trans identity with a masculine female identity, two identities that do not actually occupy the same space. It’s worth noting that though the book was finished in 2013, the pregnancy itself occurred in 2003, a full decade before. As noted in the introduction, a lot has changed in the last ten years in terms of acceptance, visibility, and logistical hurdles for LGBT people. In this way, the story acts as a kind of time capsule, preserving a moment in history and its cultural climate. 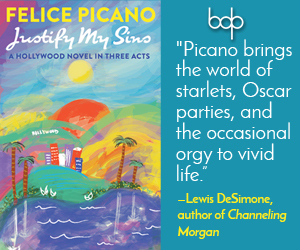 The struggles and experiences felt by the author transcend that specific cultural moment, but they are rooted there. And while the author mentions that an editor once asked her why the book was so “negative,” what really stands out is how brutally honest the depiction of her experience is. With the propagation of sugar-coated pregnancy stories, perhaps a realistic depiction does come off as negative. However, there are moments of dark humor throughout. From the descriptions of “The Merry Midwives of Cigna” to the performance artist turned childbirth educator, the story and art are laced with a sense of just how ludicrous navigating this world can be. Summers succeeds in creating a book that’s entertaining and unflinching; that indeed adds to the “stories of pregnancy that acknowledge the real pain of dislocation many feel but are discouraged from describing.” As an addition to the genre of pregnancy stories, it is vital, giving voices and faces to the underrepresented experience of butch and lesbian mothers. Ultimately, Pregnant Butch is an emotional, personal story sealed within its time period, reaching out to share that slice of life with the reader.